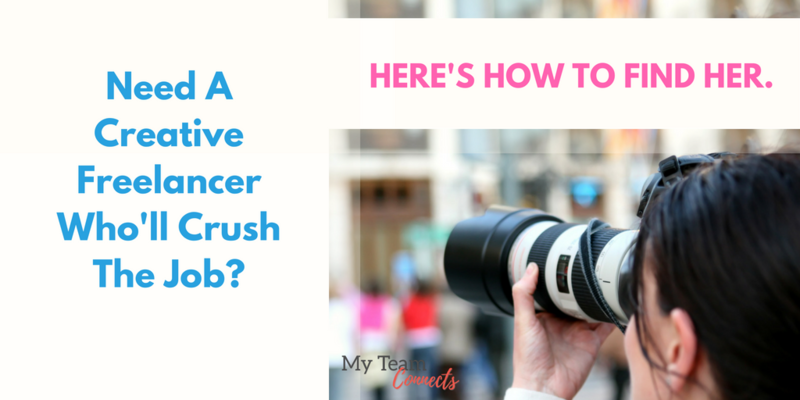 Need A Creative Freelancer Who’ll Crush The Job? Here’s How To Find Her. Are you ready to hire a freelancer to help you out with your business? As a small business owner, solo-preneur, and even a freelancer yourself, you will periodically need help for key tasks. To start, you might need a logo, some well-designed, branded memes for Instagram, product photos, a website, copywriting for your blog or Facebook ads, email newsletters, etc. You may already have a running list or things you’d like to get done, but something’s holding you back. Maybe, like a lot of new business owners, you’re not sure where to start, and you don’t have much time to learn the ins and outs of digital and print content. From working with a lot of small businesses, I know that many folks believe they don’t have enough work to hire someone yet. They assume they can throw something together themselves, or hire the neighbor’s son or a local student to get a website up, etc. This can be a workable solution just to get started. Still, it’s easy to fall behind on basic jobs, particularly in the area of marketing. The web moves fast, and you just don’t have a lot of time to pull a cohesive creative plan together. And when you’re realistic about it, your priority is sales! At this point, you just need to get on with what you’re good at. If that scenario sounds familiar, consider hiring a freelancer. For entrepreneurs and business owners stuck with some portion of a project, I recommend working with a creative professional. Freelance marketers can even help you conceptualize your brand and plan a strategy, even before hiring a creative freelancer, like a writer or graphic designer. Rest assured that the right person is out there. Consider all your options for finding a freelancer who fits your needs as well as your budget. It’s not like you’ll have to turn over too many stones. There’s a ton of talent out there. Here are a few places to look. Probably the quickest, immediate (and sometimes the cheapest) satisfaction can be found on job bidding websites. As described in an earlier post, a few websites I used to frequent were Upwork.com (formerly Elance and Odesk), Fiverr.com and Guru.com. In fact, I got some of my earliest gigs on Elance, and even work with some of those early clients today! When I have slow patches, I still pick up gigs there. Note to new freelancers, Upwork is a great place to hang your shingle if you’re new to freelancing. 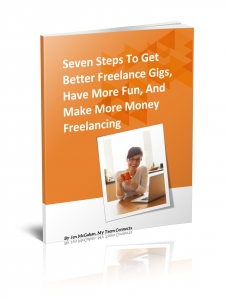 You’ll pick up other freelance providers’ tips and tricks there, too. On these hiring websites, you’ll find plenty of reliable and talented people who can help it take wing. Thousands of providers on Elance alone claim writing as their specialty; and writing is just one of the hundreds of categories of expertise to choose from. With those numbers, it’s practically impossible NOT to find someone you’re comfortable with after the first or second job. If you enjoy the process and you are satisfied with the completed work, you may even ask about hiring that person again. Then, when a similar job comes up again in her field, you have a go-to expert to contact. Creative people LOVE repeat business! Bidding work sites have been lifesavers for me, both as a hirer, and a provider . If you’re stuck in a problem at work, discover how easy it is to access affordable resources right from your desktop. The experts are there to serve you, no matter how minor the job. In addition to the bidding websites, you might also look to the agency-style website where you describe your job, and the agency matches you with the right freelancer in their roster. The benefit to these sites is that you have a higher-level marketing team watching out for you and assigning a good fit based on the freelancer’s experience, the price you’re willing to pay, and other criteria you specify. You spend no time deciding whether a possible freelancer has the chops to do the work, because the agency has already vetted them. Instead, you get to concentrate on your project and the deliverables you require. Be prepared to pay slightly higher fees for this service. Finally, if you’re looking for someone you can work with directly on a long-term basis, don’t neglect turning to your personal network. Ask friends and colleagues who’ve had similar work requests done to their satisfaction. Referrals are a good freelancer’s bread and butter, and most people are happy to refer good talent. (It makes them look good, too!) If your business friends will share the name of the freelancers they use for past projects, then by all means, start there. Let’s not forget the power of content. Many freelancers are full of helpful advice and opinions about implementing their craft. 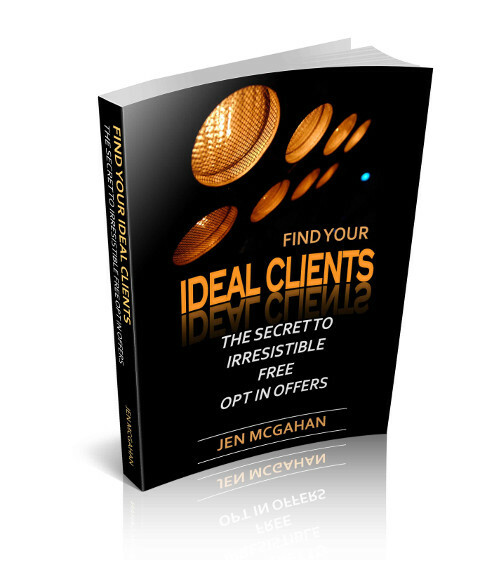 Providing information and free content is how they attract clients like you! They show off their web development expertise on blogs and social media; they share personally written articles on sites like LinkedIn and Medium; and they exhibit their artistic talent in shops like Creative Market. When an article, font or design catches your eye, note the author or artist and track her down. Divide a large project into smaller chunks and let a few different providers prove their abilities. Test the mettle of your top few picks to see which one you like the best. Then bring the winner on board for the bulk or remainder of the project. Read the feedback on the outsourcing website. You will learn about the professional’s work ethic, timeliness, communication, etc — qualities and details you may not have considered before, but which might mean a lot to you once they are on your radar. Read the personalized messages from individual bidders. See if there’s enthusiasm behind the pitch. Is he excited about your project? Why? Does he have experience with your field on a professional or personal level? For example, let’s say you need an article written about child athletes’ nutrition needs. Maybe a novice writer whose child just happens to play competitive soccer is better qualified for your sports piece than an experience sports writer who covers cycling and racing. Test the waters, and use your intuition. Sometimes the “hungrier” bidder will do a better job than the one with an impressive portfolio and hundreds of finished jobs under his belt. 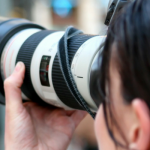 Sometimes it pays to look closely at the eager new freelancers with a smaller, promising portfolio as well as the ones who have valuable experience. Google the people you are considering. After circling a freelancer on a bidding website like Upwork, for example, I like to check around the web for more insight into the freelancer’s work, if it’s available. A search may unearth negative reviews on another site. If that’s the case, you’d want to know before you hired her. Chances are, the opposite is true. Your prospective freelancer’s work around the web could be just what you need to see to assure you to take a chance on her. Take the time and effort to write a clear, detailed job description because people can’t read your mind. If you can’t be bothered to put in the effort to describe your project, then you won’t get the results you really want. Remember that as you’re building your business, you need to be focusing on the important work that makes you big money, not struggling to learn how to do a task someone can easily and happily do for you. You intuitively know what jobs are $1000 jobs, and which ones are $50 jobs. Do the high level stuff and hire others to do the rest. If you’re just starting out, you don’t get to that point instantly. Growth takes time. But a professional creative will make you look good and keep things humming while you build your business. Now that you’ve found the right creative person for your project, what next? Start small until you’re comfortable. Start with a small job if you’re unsure how to navigate hiring and working with freelancers. As you grow more confident outsourcing projects and recurring tasks, you’ll learn to rely on others for help in your business. You may even come to rely on freelancers and contractors exclusively. The benefit to hiring freelancers is that they are as flexible as your needs. Will you decide to build a team of remote freelancers who regularly work together, or occasionally ease your workload by hiring one freelancer at a time? Will you stay local or reach out to creatives in other countries? It’s up to you. Bookmark pages or graphic designs, fonts and colors you like, to show your new freelance hire the vibe you want to convey. Will there be ongoing work if the right freelancer nails this project? Say so, and you may attract better freelancers from the get-go. Just remember that all freelancers have seen ridiculous promises from hiring sources, and certain tactics for getting cheap labor probably won’t work in your favor. Of course you need a creative freelancer who will fit your budget (the range is great), but please never say that you expect the work done for free because it’s such a wonderful opportunity for the freelancer to build their portfolio or to gain the chance to work for you again in the future. I’ve never understood why anyone would dangle that obviously poison carrot. Why would anyone worth their salt want to work for a cheapskate who wants free work done now, let alone in the future? You get what you pay for. Most experienced freelancers describe where they add value in a proposal. For example, you may find that pro copywriter demands higher fees than another writer. The reasons may range from their experience in the subject matter; to a keen understanding of the genre. As an example, press releases, newsletters, white papers, blog posts, and PPC ads are examples of four very different types of writing skills; if you’re looking for a specialist in one genre, it’s worth your while to hire a pro with that experience. Another example of added value that really pays off: Your copywriter may provide the added service of researching keywords and markets; and generally spending time learning the audience before jumping into the activity of writing. These “hidden” extra tasks and levels of expertise often translate into a higher cost to the hiring party. They also ensure that the copy is exactly on the mark, which offsets the high cost of cheap copy that doesn’t convert. Be prepared to pay a fair market price for excellent work. Expect a good freelancer to require a deposit to start work, and incremental payments as specific milestones are met. Feel free to ask questions about her past work, how she works, when she’s available to touch bases, and when she typically is in “creative” mode. That way, if she’s not answering your texts in the morning hours because that’s her productive writing time (or walk-the-dog time, or hit-the gym time, etc. ), you’ll know why. Every great freelancer will provide times when she’s be available for meetings and calls, but the hours may not be your usual nine-to-five. If weekday, workday accessibility is important to you, make sure it’s spelled at the beginning. This means you must also take into account the difference in time zones. If you have a brand kit, allow your freelancer to access to it for correct use of fonts, style and colors. The more you let your freelancer into your world, the better she can deliver exactly what you imagined, and more. 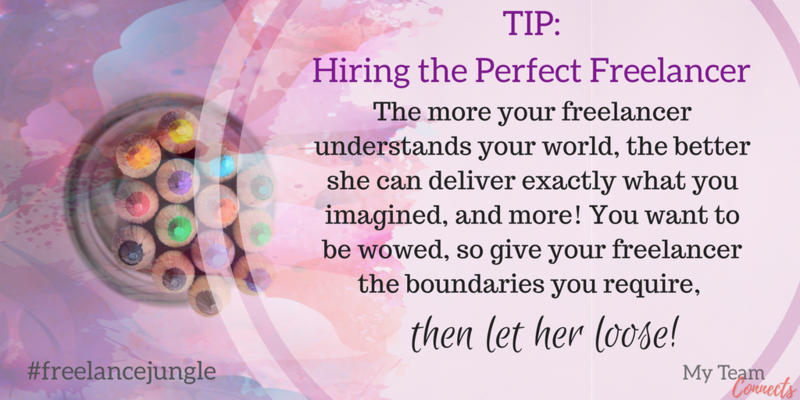 You want to be wowed — you deserve it — so give your freelancer the boundaries you require, then let her run free. By the way, if you get exactly what you expected, then you’ve probably kept the leash too short. Creative people and freelancers who have been at their craft for awhile love to deliver work that is a little surprising sometimes. They work hard to raise the bar, so keep an open mind. Make her part of your team and the right creative will give you way more value than you bargained for. As freelancing becomes a common way to work around the world, more companies and creatives will hop onboard. The benefits are pretty cool for both the provider and the hirer, as long as expectations are clear. It’s worth it to invest in finding the perfect freelancer and continue to build a relationship with that person. Over time, as projects pop up, you’ll feel you have an extension of your core team at your disposal. Do you have any questions or ideas about hiring freelancers? Are you interested in getting some of your marketing tasks — social media posts, blog writing, email strings — take off your plate? Give us a call or fill out the form below. We’d love to hear about your next project.